Website and processes: 2 Dec 16 charmaine, 5/5 Excellent "Excellent web site. " We offer a wide variety of all-inclusive introductory flying packages together with a range of Speciality flights to whet you appetite for flying. 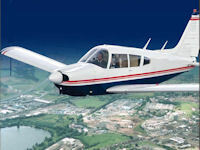 This 3 hour introductory flying package is designed to get you started on your training towards the issue of your very own Private Pilot's Licence. It comprises three 1 hour lessons in a Cessna 152 (a 2 seater aircraft) taking you through the initial stages of the PPL course. All lessons include ground school prior to each flight. As with all the Introductory packages the price is fully inclusive of landing fees, instruction, third party insurance and club membership. Once you get the 'flying bug' you can progress to the full PPL (Private Pilot's Licence) course; complete an IMC course (flying on instruments); fly a twin engined aircraft; train as a Commercial Pilot (and join the airlines) or become a Flight Instructor! We can train you for all these courses: we have friendly, professional flight instructors to smooth your way through the various courses - hence our motto the 'Friendly Experts'!